This is a seascape photo I managed to grab a couple of weeks ago from Burns Beach its a place I’m starting to look at more closely as there are heaps of rock formations around. Yes there is heaps to photography in Perth but I have to admit I’m getting restless and hanging out to head down south again to Fletcher territory to get some awesome shots. Well off to try and get some more shots. Let’s hope the breeze doesn’t pick up and blow all these great clouds away! This entry was posted in australian seascape photography and tagged australia, australian sunrise, beach, burns beach, coastal photography, landscape photographer, landscapes, long exposure, seascape photographer, seascapes, sunrise. What’s the exposure on the ocean? around 35s maybe? I think it was around the 30 sec mark. Nice dreamy atmosphere, great colours! Like it very much, really like your seascapes Jamie, have been studying them a lot after I have become such a lover of the sea myself. Composition: I love how the rocks and the clouds point to infinity. Perhaps try and crop the top and bottom so the clouds and rocks “escape” out of the frame. Instead of containing everything in frame, it often creates much more drama and visual tension if there are elements “escaping” out of the frame. Thank you. Its the best compliment I’ve had in ages. There is just something about the sea that is so captivating. How does one capture its power? Its shape and form? Its calming effects? That is the challenge for me. I’ll try out your cropping suggestion. Jamie, no worries mate, well deserved. I am having the same issues you are contemplating – I stare at waves for hours, I sit mesmerized on the beach taking in the experience of water, sand, sound and smell and power. How to capture this in a photo? It is a great challenge! I think one has to do what you’ve done Flemming to even start to be able to capture the ocean. You need to feel it, experience it, respect it, love it and only then can you start to capture it. I often get to my intended spot an hour beforehand and sit there and allow the ocean to show me what it wants me to shoot. Quite often she will by having a unique wave break in a certain spot, or she will recede in a certain spot to show me some rocks that often aren’t visible. I find that as long as I can listen to what the ocean is trying to tell me I can normally get a pretty good shot of her. That is a wonderful shot. I myself is looking at trying to get shots like this. Maybe oneday. Thanks for that. What is stopping you from taking them now? For some reason I just can’t get the setting right. I just need to read more on it and practice. I also need to get out more on the weekend, without hubby and the kids (hehehe). haha. Any excuse to leave hubby and the kids behind! Really like the the colour palette in this one Jamie. Hope your new family addition is settling in! Thanks for that mate. Yes little Flynn is settling in quite nicely. Looks like we have another sleeper on our hands. Woo Hoo. Nice simple yet strong composition in this one Jamie, I like the water colours as well. Thanks for that. I liked the composition as well. Just goes to show that simple ones often work the best. Great shot Jamie! Like many people here, I find your work truly inspiring. I’ve been to this beach a couple of times and it’s probably my favorite beach to photograph in Perth. Wow. Thanks for the great compliment, it certainly made my day. 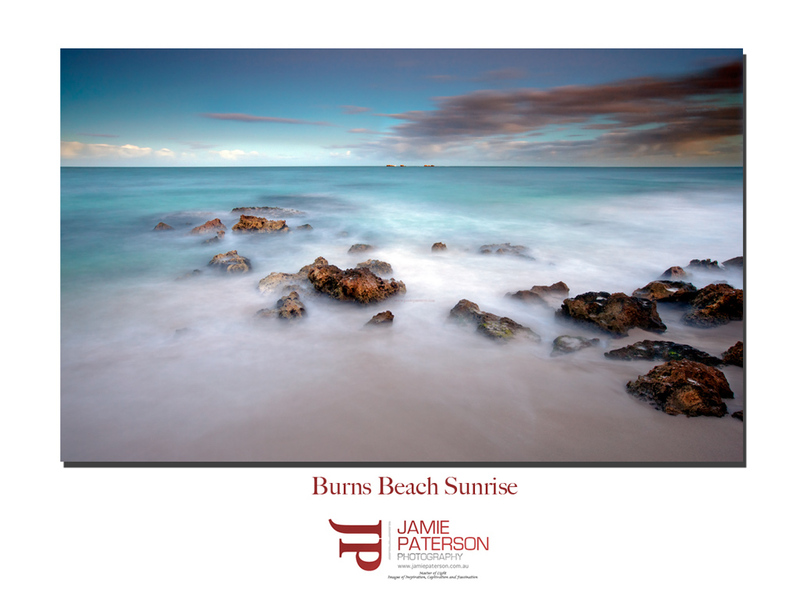 I agree that Burns Beach certainly had character and I will be back up there soon. Until then I think North Cottesloe still stands as my favourite.